Breaking News: We now offer the Singer logo and Featherweight script as an option, as well as custom embroidery! Click on the separate options for Logos and Embroidery back on the Carry Cases category page. 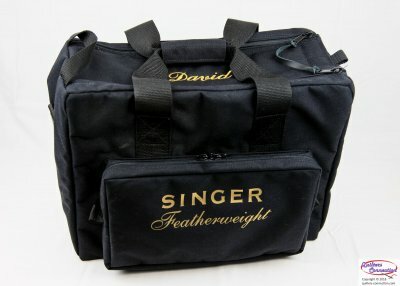 For years we recognized the need for a high-quality, padded carrying case for the Singer Featherweight, as an alternative to the original fragile, unpadded wooden cases or poor quality foreign made bags sold online. We worked with a top quality USA manufacturer to specify these one-of-a-kind bags made especially for the Singer Featherweights. The bags are as functional and practical as they are beautiful. Your foot controller can be either placed inside the main compartment next to the fold-up bed, or stored in the single large outside pocket. The bag features 1000-dernier nylon outer shell, closed-cell foam padding, as well as a hard cell insert for the bottom of the bag. The heavy duty handles are reinforced and held together with a 2" wraparound handle. A padded carry strap is included with every bag! Besides being strong, these bags are 30 percent lighter than the original Singer wooden carrying case - see photo! And no more worries about your wooden case handles failing or the bottom dropping out, damaging your precious Featherweight. OUR CASES NOW FIT THE SINGER 301! Ever since we came out with our Featherweight case, customers have begged us to make one for the Singer 301. So many 301's came in cabinets, and the original Singer carrying cases have become fragile and hard to get. And so many of our FW owners have discovered the greatness of the Singer 301 and longed for a carry solution. So we slightly enlarged our Featherweight cases and they now easily fit the short and long bed 301s. 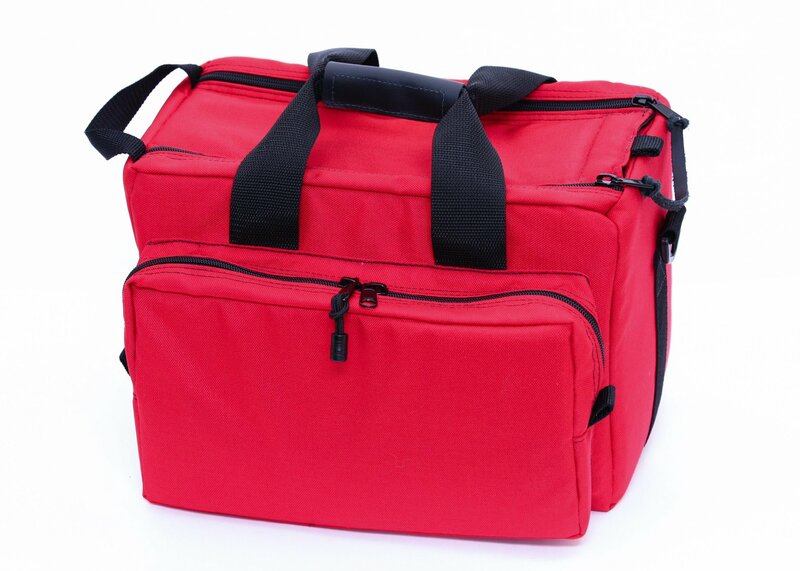 • Main compartment: 17” L x 7-1/2” W x 12” T.
• Fully padded & lined: Bag is constructed with an outer shell of 1000 denier nylon, an inner lining of 600 denier polyester and a closed-cell foam core. • One large outside zippered, full-length pocket: 11” L x 8" T x 2” Deep. • Double zipper top for easy access. • 2” one-piece wraparound handle. • Weighs 30 percent less than the original Singer case. • Made right here in the USA! • Fits all models of the Singer Featherweights, including the 222 Freearm, and NOW FITS THE SINGER 301! • Available in Red, Black, Purple, Pink, Regatta Blue, and Neon (Lime) Green. ALL COLORS are now in stock just in time for Christmas! Tip - Don't forget that we offer free shipping on orders of $ 150 or more. Check out our Featherweight parts to find more items and take advantage of free shipping!